It cannot be denied that a huge number of employees are really happy about the different implementations o the 7th pay commission, but it cannot be denied that the paramilitary forces have been deprived from their deserved appreciations and pay increments. It is a fact that the demands of “One Area one Allowance” has been placed by the Paramilitary forces a long time ago, but the government has not paid any heed to the demands. This has caused dissatisfaction among the huge number of Paramilitary personnel. The six paramilitary forces that are working under the Union Home Ministry’s command, have demanded the “One Area One Allowance” for those troops that are on duty for a constant period of time during, heavy conflicts, anti Naxal operations and also the counter insurgence tasks. To be really precise, the demands of the CISF and other central paramilitary forces are definitely valid since they are not at all allowed any special allowances like any other central government employees but they have to work under much more tough conditions and also the services offered by them are round the clock. With the recommendations and implementations of the 7th pay commission, there has been the increment of pay scale for the employees of central government departments. With this situation in mind, the central government has offered an apex of Rs 80000 for paramilitary forces and thus, it has removed the anomaly in the pay structure of the paramilitary forces working under central government. Another important decision taken up for the benefit of CISF is, the approval of the Cabinet Committee for the construction of 13072 houses and more than 113 barracks for the 68 locations of CISF and other paramilitary reserved forces. This is regarded as the 12th five year plan and is estimated to end in the year 2017. The estimated cost shall be over 3090.98 crore. There are more than 9 lakh personnel working under paramilitary forces of central government, and with the sole objective of enhancing the pay structure of the paramilitary personnel, the MHA has offered a “special pay” for the army and also a better leave structure. The armies can get casual leaves of 20 days annually, the jawans get 30 days of casual leave annually but there is disproportion in the casual leaves of paramilitary forces. They get only 15 days of CL. It has been argued by the paramilitary forces that they are being placed in the “civil” category with a grade pay of 2400, but their work ranges from guarding the border, defending tense situations, involving in Naxal operations and different insurgent groups of tough terrains in India. They are also engaged in duties like crowd control, rescue operation, election control, VIP arrangements and many other security duties. Considering such duties, the grade pay of 2400 by the 7th pay commission, which is similar to a “civil” grade pay, has not been justified for the paramilitary personnel. In terms of allowances, the paramilitary forces are paid less. 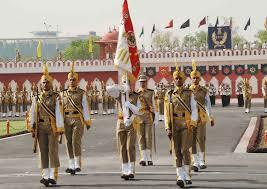 There are about 38000 officers within the army while the paramilitary force comprises of 16000 men. A single unit of army has only four companies while a paramilitary battalion has 6 companies and the officers for CISF take command of more number of troops than any other army officer. But still their pay scale has not been improved and allowances are less than army. The contributory pension scheme has been neglected by the government for a long time which was initiated in the year 2004. To view the pay slip of the CISF, the first step is visiting the website http://www.cisf.gov.in. You shall need the registration number for viewing the slip. When you are at the home page of the CISF website, you need to look for the link known as “employees’ corner”. Click on that link and then you shall have to click on “Welcome to CISF”. When you go to the CISF page, you shall be redirected to “employees’ corner”. After this, you need to enter the password, username that was given to you at the time of registration. A problem that you might face while entering the username is this is the Force Number that has been provided during registration. And if you have forgotten your Force Number, then check the appointment documents or you can also contact the reporting officer. The password is your date of birth in the format DDMMYYYY. Once you have logged into the site, you shall be able to check out the salary slip. Now, you will have a lot of options. For instance you can view the month for which you want to see the salary slip of CISF employment. Also you shall have the option of printing the salary slip directly without downloading it from your computer. For those who are having any difficulty in checking the pay slip o the CISF, in the above mentioned method, for them, there is also another way in which you can check out the salary slip. Check out the details below. Visit the login page http://164.100.43.36/payslip/login.ph. Through this link you won’t be required to visit the CISF website directly. You can open the link directly by copy and pasting this address on h address bar. Now, open up your account by giving the username and password in the similar manner mentioned above. Similarly the username shall be force number and password will be DOB. If you are looking to access the GPF details on CISF pay slip, then you can also do it through the same website mentioned here. If you do not input the GPF account number or the mobile number, you shall not be able to know the details. Sometimes there are options of putting either the GPF number or the registered mobile number. You need to put either of them. After that click on the year and then again click on “GO” for viewing the GPF details. 1. Increment in apex pay The apex pay of paramilitary forces has been increased to Rs 80000. This brings down the anomaly in the pay structure of paramilitary forces. 2. Quarters and barracks for CISF The Cabinet Committee has allotted construction of 13072 quarters and 113 barracks for CISF personnel throughout the country. 3. Leave structure While the armies are entitled to 20 days and jawans get 30 days leave, but the paramilitary forces get leave of 15 days. This has been decided to be increased. 4. Unjustified allowances and pay A single army unit comprises of four companies, while a single unit of CSIF incorporates more than 6 companies, so the CSIF deserved an increment in the pay grades. The paramilitary forces are engaged in different life saving activities, Naxal operations, guarding borders, defending tense situations and election controls. But their pay is identical to the “civil” pay.